This periodic table is a little different. Each element group is represented by a different cat. Each cat contains the element’s atomic number, symbol, name and atomic mass. The above image is 1920 by 1080 pixels , making it suitable for widescreen HD monitors. The file is a transparent PNG file, so your background color will be whatever your default background color is. You can change this color in your display preferences to suit your taste. Click the image to view full-size. 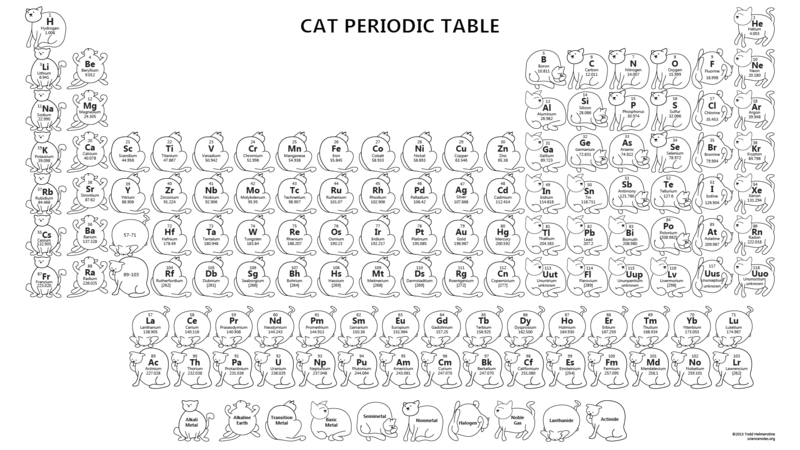 If you’d like to print this cat periodic table, it is available in PDF format. Choose “Fit” and “Landscape” for your print options. There are color versions of this table with different backgrounds available here.